Once again, the most fan-friendly team in pro sports was pushing all the right buttons, as the Penguins sent superstars Sidney Crosby and Evgeni Malkin out to deliver season tickets on Monday, continuing a tradition started several years ago. 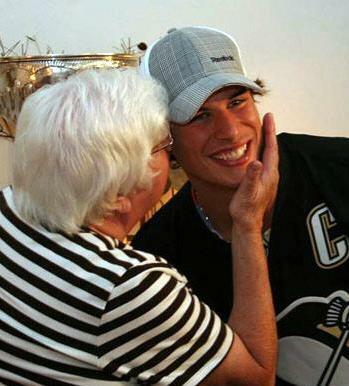 Sidney Crosby was directed to the home of Castle Shannon's Alice Kilgore, a 38-year season ticket holder who he actually delivered tickets to back in 2007. In '07, Kilgore predicted that the Penguins would not win the Cup that season, but "maybe next year". Well, her prediction came true, and her reward was a personal visit from Crosby and the Cup - a pretty fair deal in anyone's book. Crosby did not rule out a return visit in the future, saying “If she keeps predicting things like that then we’ll be here every year delivering her tickets." As usual, I like his attitude. Geno Malkin delivered his tickets in an Alyonka Larionov-hosted segment, which I'm guessing will probably add significantly to the amount of hits his video will receive. Although it's worth noting that no pierogies were made in this webisode. Nine other Penguins will be delivering sets of tickets on Tuesday, including stars such as Marc-Andre Fleury, Jordan Staal, Bill Guerin and Sergei Gonchar. Steeler ticket office - I hope you are listening! This is so awesome. It really can't be understated. Way to go Pens. The Steelers are too busy sexually harassing women to do stuff like this. It was tough watching the Malkin video because he and Lemieux didn't have a thing to say to each other. The Pirates also hand deliver their season tickets every year but that guy is never home. Geee, could the people Malkin was visiting be just a little more excited. "Thanks for coming Geno, I have a Lemieux jersey, could you sign this, ok bye." I've received better welcomes from State Cops after being pulled over for speeding. The best was the end where Geno was slowly walking away like "what the F was that?...I'm go drink now." i agree with your statement about the steelers. the penguins do this, the pirates let season ticket holders (yes i am one) have a field day where pnc is ours among other benefits. my dad is a steeler season ticket holder and all he gets is a christmas card. i guess thats what happens when you sell out every game whether your 16-0 or 0-16.